These pages provide information on the making of the documentary film Students at Work: Learning to Labour in Higher Education. In addition to providing free access to the film, the pages document the process of researching and making the film and include further information for those interested in thinking critically about the University and the role of the students and staff who work and study within it. 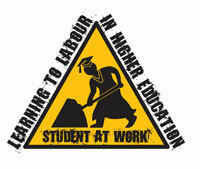 Students at Work: Learning to Labour in Higher Education was researched and filmed by a team of undergraduate and postgraduate students and administrative and academic staff who were all based within the Sociology Department at the University of Warwick. The film has taken almost three years to complete: during this time one member of academic staff has moved to a new job, and some of the students have graduated and are either working or are undertaking postgraduate study. You can read more about the film team and all the people involved in its production. This unusual collaboration was one of the most important aspects of the making of the documentary. This film was produced as a way of communicating our research on the topic of students working and studying in Higher Education to a broader audience. Yet, we see the film as a beginning of a dialogue with students and academics on what the university is for. Please share your thoughts on the film. You can get in touch with us at reinvention at warwick dot ac dot uk.